This crystal is from Brazil and is 3.5 oz and 2.7” by 1.7" by 1.8" and is alternating creamy-white bands with blueberry purple ones. 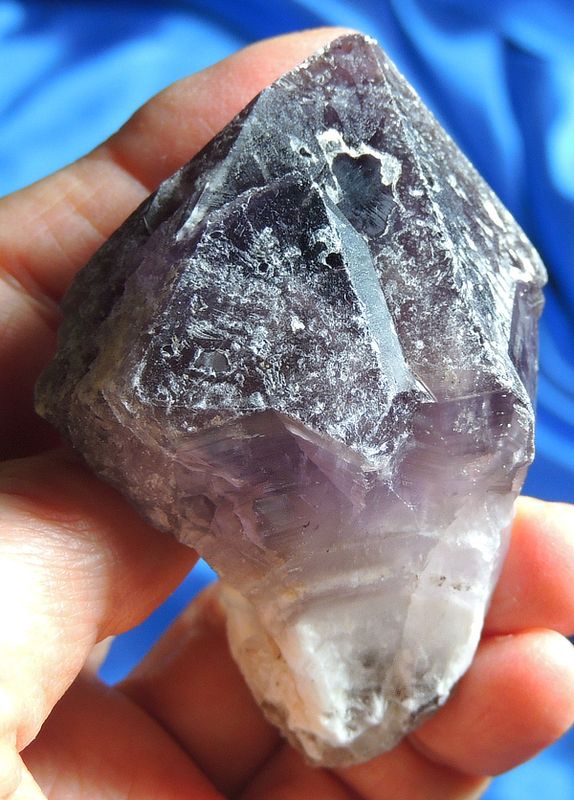 Her general color is a deep amethyst with frosty markings across her intricately-glyphed faces with even a few trigonic record keepers … she rather reminds me of the indigo quartz without the hematite cap, but the energies are far different. Backlight her and her deep amethyst pervades the crystal. I think you will be totally in awe of her subtle beauty! Plus she is deftly twinned! She has a few tiny dings, but nothing of significance. She may look humble, but her energy is apparent as soon as you pick her up! This Spirit has the most sweet and gentle energies in spite of her apparent dark appearance. I love the feel of amethyst anyway, but she is so soothing that you feel like you should tuck her under a pillow and take a nap. She settles you down and allows a feeling of contentment to fill you. Stress melts away, and you feel very at peace with the world and as you doze, she encourages sweet dreams and gentle lessons. She teaches how to accept, manage and embrace life’s transitions of all kinds and is as welcoming and loving as outstretched arms when you most need a hug. We live our life in layers – every change brings on a new one and she is your loyal assistant in weathering the change … she will be your go-to crystalline friend.